On the hardware side of things, the Sony Ericsson Mix Walkman has a 3 megapixel camera module for a maximum image resolution of 2048 x 1536 pixels. There is neither autofocus nor flash. The camera interface is as simple as it gets with three buttons in total. There is a camera/camcorder switch, a gallery button and an on-screen shutter key. There is no geotagging or advanced image settings. This is certainly one of the most basic camera interfaces on the market but we guess Sony Ericsson thought users wouldn’t need much more and would prefer simplicity to functionality. In the end, it all comes down to the image quality, so let’s see. Unfortunately, the amount of resolved detail is pretty low and the contrast of the photos is a mixed bag. And with the noise levels also pretty high, you get the idea that you better use the Sony Ericsson Mix Walkman camera for taking contact pics only. We’ve also added the Sony Ericsson Mix Walkman to the database of our Photo Compare Tool. The Tool’s page has a quick how to guide and also what to look for. You can clearly see from the comparison tool that the shots are pretty much identical with most of the 3 megapixel snappers out there. Video recording on the Mix Walkman goes as high as QVGA resolution, which, needless to say, is far from impressive. The frame rate is also low - just 14 fps. The interface of the camcorder is similar to the one on the still camera. You can only set the video quality, no other settings are available. Videos are rendered in 3gp format, but actually look good. Then again the low resolution and frame rate make them useful only for MMS and nothing more. Here is a QVGA@14fps video sample to check it for yourself. 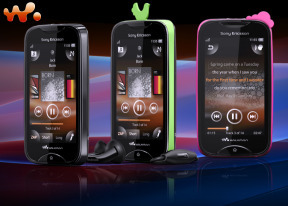 The Sony Ericsson Mix Walkman is an entry-level handset and nobody should expect an impressive connectivity package. There are no GPS or 3G, but Wi-Fi b/g is quite a perk. Network data speed is limited to GPRS and EDGE. Local connectivity comes down to USB v2.0 and Bluetooth. There’s also a memory card slot, which can usually give you the fastest data transfer rates, but it’s under the battery, so no hot swap.